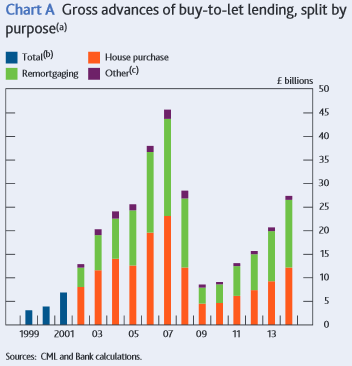 Buy to Let (BTL) mortgages represented 15% of the total outstanding residential mortgage loans at the end of 2014 with gross advances of new loans recovering back to 2005 levels (see chart A). Total annual gross lending has grown since 2010 to £27.4 billion reflecting increased supply and demand factors with BTL now standing at 45% of all residential house purchases. BTL remortgages have also grown substantially to 52% of transactions with improvements in the availability of products and loosening of criteria. 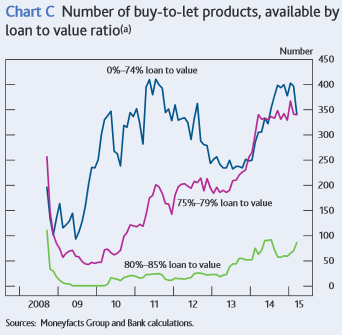 The number of BTL products advertised has doubled since the financial crisis and while most loans are still at or below 75% Loan to Value (LTV) there has been a steady increase since mid 2013 in loans between 80 – 85% LTV (see Chart C). 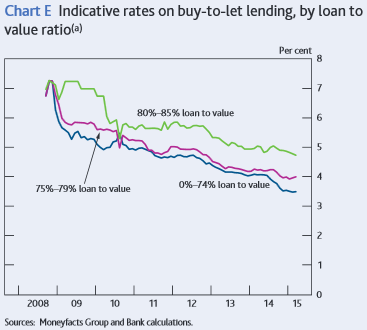 Pricing of BTL over the last 12 months has fallen sharpest for loans at or below 75% LTV (see Chart E). Although Fixed rates have fallen, it has not been by as much as the reduction in reference swap rates, with the spread on rates rising. This spread is expected to narrow during 2015 with further reductions in BTL fixed rates. 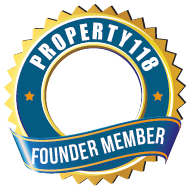 The rate of possession of BTL properties was almost twice as high as owner-occupier ones, even though the rate of underlying arrears on BTL lending remained lower in 2014 according to data from the CML. The CML commented that this was because lenders offer extended forbearance to owner occupiers to help them get through periods of financial difficulty without losing their home. Neil, thanks for this, it's very informative. I am trying to get a feel for how unstable the situation will be if another recession comes. Do we know how many new mortgages are sold in each LTV bracket each year? You give the info for products available, but it would be great to know it as completed new mortgages. There was not a break down of the amounts of lending in each LTV band. However the vast majority of the market is at or below 75% with very little above 80%. It is not the new loans that are a concern, but the old mortgage books with properties still in negative equity or very low positive. In terms of mortgage arrears over 3 months BTL consistently out performed residential mortgages over the financial crisis period. 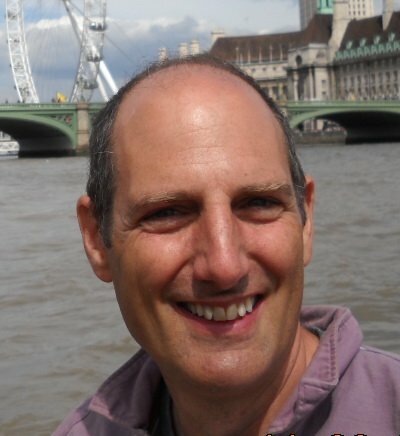 Thanks Neil, it is good to know that there are few new loans with LTV's above 80%. Perhaps the old loans in negative equity are for properties in higher yield regions (esp. not London) so the landlords are in solid profit in the rental account. This would mean they would not want to sell anyway and there is no 'systemic risk' to the UK economy. Is that likely? Last Year The Bank of England performed a stress testing exercise on all the major banks to make sure they were capitalised sufficiently to withstand another crisis of quite extreme proportions and any that marginally failed are taking corrective measures. Thus making the banking system much more robust than it was in 2008.